How can I save water in my pool? This year’s drought and hosepipe ban has drawn everyone’s attention to the issue but it makes ecological and financial sense to use as little water as possible running your pool. How does a swimming pool lose water? The average family swimming pool will hold 18,000 to 20,000 gallons of water. Once your pool is full, it starts to lose water from evaporation. The amount of water that is lost in evaporation is dependant on a list of variables such as the surface area of your pool, the temperature that the pool is kept at, the air temperature and humidity of the surrounding air and the wind speed. How much water you lose from evaporation is therefore pretty hard to work out – but you can see it; the water level may drop by about half an inch a day in a warm, British summer. The next big loss of water comes from using the pool. Diving, splashing and having fun is what your pool is for but the water that ends up on the deck and pool surround is water that has to be replaced. Keeping your pool clean uses water; when you backwash your pool’s filter that water is lost to the pool and has to be replaced. If your pool has a leak, then you are obviously loosing water. When your pool is winterised, you pump some water out of the pool to lower the level and that water is lost too. What can I do to reduce water loss from my pool? The biggest loss of water from your pool is caused by evaporation so that is the first place to start. A pool cover that sits on or over the water surface when your pool is not in use will dramatically reduce the amount of water loss as well as saving your fuel bill as it will also help retain the heat in the pool. There are many different types of pool cover and some are more efficient than others. Of course, the least efficient pool cover of all is one that you own but don’t use, so a pool cover that is easy to put in place, perhaps an automatic one that closes at the touch of a button, makes a sensible choice. DEL make a range of pool covers and one of their models is almost certain to be perfect for your needs. Many of their automatic pool covers can be solar powered and they also produce a range of polycarbonate slats that absorb and retain the suns heat. DEL pool covers are suitable for both new build and existing pools and their solar slats can be fitted to almost all other makes of slatted pool cover. Evaporation rates are affected by the difference between the water temperature and that of the surrounding air, so running your pool a degree or two cooler will reduce the amount of water loss and save you money on heating bills. Because wind speed is a factor in evaporation then a windbreak that reduces the flow of air over the pool will make a difference. Trees, shrubs or a fence can all act as a windbreak and therefore reduce the amount of water lost through evaporation. The next biggest loss of water from your pool is likely to be from splashing. It’s fairly obvious how you go about cutting the amount of water that is splashed out of your pool. 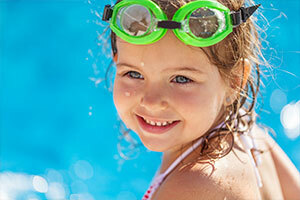 If you have children who enjoy playing in your pool or you like being energetic in the water yourself, then you may choose to accept the amount of water lost. But it is something to bear in mind. When you backwash your pool filter then that water is usually pumped to a drain. A MultiCyclone filter can be installed as a pre-filter and this unit uses no energy but traps dirt and debris before it can get to the main filter so cutting down on the amount of backwashing that you need to do. The cleaner you keep your pool, the less frequently you’ll have to backwash, so it makes sense that everyone takes care to keep as much dirt and debris out of the pool as possible – and a pool cover will keep the water clean when the pool isn’t in use – and to ensure that the water is well balanced and treated all of the time. Your pool is bound to loose some water but if you are topping up by more than three or four inches a week then you may have a leak and it would be worth investigating. One simple test is to put a bucket of water next to your pool and mark the water level in the bucket and the pool. If after 48 hours the level in the pool has fallen by a greater amount than that in the bucket then that is a good indication that your pool may have a leak somewhere. If your pool only leaks when the equipment is on – that is when the filter pump is running – you may have a pressure-side return leak. If the pool only seems to leak when the pump is off, this usually indicates a suction-side leak. If your pool leaks all the time then that doesn’t rule out a problem with the plumbing but it does make it more likely that the problem is with the shell or liner. It is possible to find and fix a leak yourself but if you would like us to help you find an appropriate pool professional in your area, then just use the contact button at the top right of this page or follow this link. What might I be able to do longer term? People will always enjoy swimming and the pleasure of owning your own pool is unlikely to lose it’s popularity, however green issues and an awareness for sustainability and the environment will mean that people will want their pool to have less of an impact on the planet and use less water and energy. The technology exists to treat the backwash water that normally is drained away, and recover the majority of it to be used again in the pool. The cost of the equipment is really the only issue but as water bills rise, installations like this could become more popular in the UK. Another possibility is to harvest the winter rain water by using a pool cover pump to collect the rain that falls on your pool cover when it is in place and store that in tanks where it can be treated for later use in the pool. One piece of technology that does exist and is affordable and easy to retro fit is the MultiCyclone which, by reducing backwash frequency, can result in savings of up to 5,000 litres per year in an average domestic pool. If you would like some specific advice on water saving and would like to find an appropriate pool professional in your area, there is a contact button to the right of this article that can get that process started.